With fall here, most water parks and community pools are closing for year. Many of them closed in September. But here in Florida we are blessed with slightly better weather for watery fun. That's why Legoland Florida is closing its water park on Halloween -- except for one special day for the dogs. 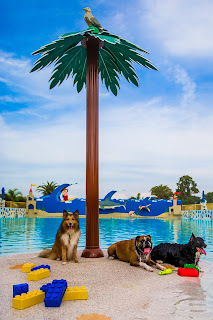 On Sunday, Nov. 8 Legoland Florida in Winter Haven is letting dogs into the water park for Everything is Paw-some! From 1 p.m. to 4:30 p.m., dogs will get to splash around in the LEGO® Wave Pool, DUPLO® Splash Safari pool and the Joker Soaker pool. There will be other events too. The best part of all, the event benefits Humane Society of Polk County! Admission is $5 per dog, $10 per human, with a one-dog-per-human maximum. And parking is included. People can also take part in the VIP party (Very Important Pooch) for $55. They include all sorts of stuff, like champagne! This is a great way to have a fun time with your dog, and support a local animal shelter. 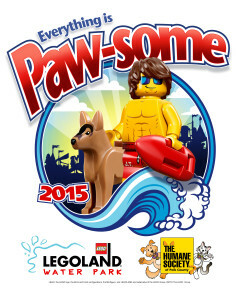 For more information and to purchase tickets for you and your pooch, register online with Legoland. For details on the VIP Experience Pooch Party and sponsorship inquiries, call (855) 753-7777 or contact llf.vipexperiences@legoland.com. How cool is that???? It looks like a Sheltie will be in attendance too!